Janna Kysilko Dressage is proud to team up with Olympic gold medalist Christine Stückelberger to represent the following fabulous horses with top European bloodlines! All are in training with Ms. Stückelberger, and located an easy distance from the Zurich airport in Switzerland. Please use the contact form to request more information. This dynamic son of the top German breeding stallion Abanos has the potential to be an international star both in the dressage arena and as a stud. With top scores in both dressage and jumping, he has completed five of the six qualifying tests towards the Keuring, and is expected to complete his qualification in 2011. He has extraordinary, world-class movement, and a joie de vivre in his work that gives him great expression and flair. With the Oldenburger Abanos on top and the Holsteiner bloodline of Ramiro on the bottom, this horse lives up to the quality of his pedigree. Price will be 150,000 Euro after Keuring. Super light and easy to ride, as well as correct and expressive in his gaits, "Heini" is an amateur's dream. He has been competed internationally through L-M (approximately 2nd level) and has begun schooling flying changes. At the equivalent of 1st level he has won classes with an amateur rider, and proven himself safe and reliable in the show situation. Priced at 30,000 Euro. Internationally placed through grand prix and grand prix special, this hansom son of De Niro could take your grandmother to grand prix. He is extremely gentle and safe, whether in the show ring or out on the trail. His extensions fetch 8's and 9's in the show ring, and the suspension in his flying changes is jaw-dropping. Recent x-rays of his legs, back, and neck are totally clean. Priced at 200,000 Euro. Recently started under saddle at walk, trot, and canter, this mare already shows a super temperament and character. By the Shagya Arabian sire Normative (one of the top Arabian dressage stallions) and out of a Hanoverian mare by Ramiro's Bube, she seems to have received the best of both breeds, being alert and sensitive, yet calm and sensible. Priced at 15,000 Euro. This lovely mover sired by Davignon (Donnerhall) is out of a Staatspruefung champion mare by Finale (Poseidon). He has recently been placed in work with Christine Stueckelberger and is currently training at 1st level. He shows great promise in his extensions, and is easy to handle. Priced at 22,000 Euro. As a three year old with one month under saddle, this mare took 8th in dressage and 5th in jumping among the 78 participants of the mare testing. 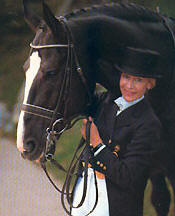 At four, she received a score of 7,5 and qualified for the Bundeschampionat. The elegant quality of her gaits is already evident, even though she is still growing and will probably mature to at least 16.2hh. Sired by Ramiro's Bube out of a Calando mare, Candy has superb Holsteiner breeding. Priced at 25,000 Euro. Interested in any of these horses? Please use the contact form to request more information. Photos and video are available on request for many of these horses, and Janna has ridden all of them, so she can give more detailed information about their ridability and temperaments.